Available in a standard-issue paperback edition for a mere $12. Also available in a classy hardcover edition for $36. Both editions have the same contents! The only significant difference is that the paperback version marks you as a smart fiscal conservative who can be trusted to make good decisions with money, while the hardcover says, "Yo, I'm a big pimpin' high roller and I don't care who knows it!" As with all issues of GameSpite Quarterly, this book is printed on demand and will never go out of print. The past few issues of GameSpite Quarterly have been fairly epic. Or at the very least, they've been very thick and very ambitious. For Issue 7, we decided to step back and take a bit of a break with a lighter issue. That’s “lighter” as in “slimmer,” but also “lighter” in the sense of “crammed with levity.” Are you not amused? Yes, in keeping with our increasingly circular issue structure, this latest issue serves as a counterpart to GameSpite Quarterly 3. Where that volume served as a not-entirely-on-the-level compendium of famous (and not-so-well-known) heroes of 8-bit games, GameSpite Quarterly 7 touches on the nefarious villains they battled—both infamous and hardly famous at all, of course. As usual, each author is responsible for coming with his own take on the topic he or she claims, so the tone and reliability of this issues contents are all over the place. On one hand, you’ll find an insightful evaluation of the true threat posed by Dragon Quest’s seemingly innocuous slimes; on the other, a rap song performed by Tetris’ bastardly S and Z blocks. Here’s a treatise on the dangers of Final Fantasy’s Malboros, there a narrative exploration of the nature of the pact forged between Final Fantasy’s Chaos and his millennia-spanning minion Garland. The 8-bit era, given the versatlity of its underlying technology, spans more than two decades of hardware and games, so this is easily one of the farthest-ranging issues of GameSpite Quarterly. From the Grues and Invaders of the ’70s to the Guys you wanna be and sultry half-genies who appeared over the course of the decade just past, we’ve chronicled quite a collection of bad guys. And also, lots of not-so-bad guys. After all, so often are villains merely misunderstood or misguided rather than completely rotten and cruel. Of course, plenty of them are the latter. Thanks as always for buying or otherwise reading GameSpite Quarterly! Your continued support for our efforts -- even whimsical ones like this -- make our lives feel just a little bit less meaningless. All copyrighted images used under the principle of fair use. 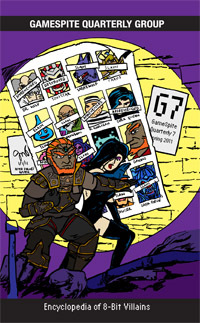 GameSpite Quarterly 7 is a reference publication tinged with an edge of satire, not a derivative work. No claim is made on others’ property. Copyright attributions are given to the best of our ability; given the age of the games covered in this issue and the fluidity of rights for licensed products and defunct publishers, we chose to provide relevant attribution at the time of each work’s original publication. Next Issue: You are not <FONT COLOR=”#FF0000”>e</FONT>. On sale May 1.